If you are about to order a Moto-bicycle, you can fill out your order by clicking on the blue buy button in a shop page. If you do not like this, write us an email or call us. Company: FURKA s. r. o. Payment is possible in a number of ways, depending on the place of delivery. Payment can be divided into two parts or you can pay the full amount. Transfer amount directly using your bank. 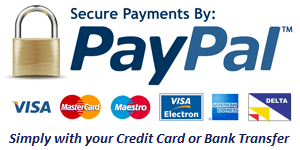 When selecting payment with PAY PAL you can make simple and fully secure online payment. If you are interested in paying only when delivered, choose the PAY ON DELIVERY to pay with a cash or your credit card directly to the curier company on delivery (POST/PARCEL SERVICE).